Nose: Wet timber, moss, ripe grapes, and mixed red-berry jam. Also, unusually for an Octomore, there is quite a prominent amount of newmake spirit and paint-stripper on the nose. Also a hint of some portwine jelly. Given a bit of a breather, the paint-stripper and newmake spirit dies right off, with the berries and jelly becoming far more prominent. Palate: Very sweet, with a hint of peat. The grapes and mixed red-berry jam from the nose are quite bold on the palate. Thankfully the paint stripper has departed, although there is still a hint of some newmake spirit at the back of the tongue. There’s still a slight trace of the wet timber, and also a bit of green apple & strawberry juice lurking around the sides. An unusual combination of sweet and acidic. The more you have, the more prominent the berries are. A little bit of a breather, and the over-done sweetness, and the newmake spirit, mellow out. Mouthfeel: Quite thick, and reasonably oily. A bit of a burn from the alcohol, but not too much. Finish: Quite long. Very sweet, yet somehow a touch sour. The wet wood and berry jam are still going strong. A little bit of peat is still hanging around, but only by its finger-tips. Despite the mouthfeel being quite oily, the finish is very dry. Balance: A bit of a see-saw of flavour profiles in this whisky – both sweet, and yet also slightly sour and acidic at the same time. The flavours though do flow nicely from the nose to the finish – even the slight burn on the tongue from the alcohol doesn’t really disrupt the whisky at all, but rather accompanies it as another sensation in the whole package. Octomore 2.2, also known as Octomore Orpheus, was peated to 140ppm, has been aged for 5 years in Bruichladdich’s warehouses on Islay, and was finished in Château Pétrus casks (one of the top Bordeaux wines). It was bottled at 61%ABV with no colouring, and no chill-filtration. Only 15,000 bottles were produced. Unusually for an Octomore, this edition really does well with a good breather. Give it such, and it goes from a good whisky to a damn fine one. I also find, that like most of the Octomore editions that have been released so far, despite the high alcohol content, giving it water makes the whisky a bit creamier, and does diminish the newmake notes, but ultimately unravels the masterpiece that this whisky is – I recommend letting it sit for a moment, but stay away from both ice and water. Octomore 2.2 was the first of Bruichladdich’s “Cask Evolution” series of Octomore, and they certainly got off to a bang! Octomore 2.2 was Jim Murray’s Single Malt of the Year (multiple cask) in 2010 – quite an accomplishment for the third edition of a 5 year old malt! Named after the poet and musician of ancient Greek myths who travelled the underworld and pleaded with Hades to allow his slain wife to return; it is one of only two Octomore editions to have a name, along with Octomore 4.2, Comus. The bright red tin that Octomore 2.2 comes in is apparently homage to the fires of Hades that Orpheus (the Greek, not the whisky) would have been well acquainted with in the underworld. 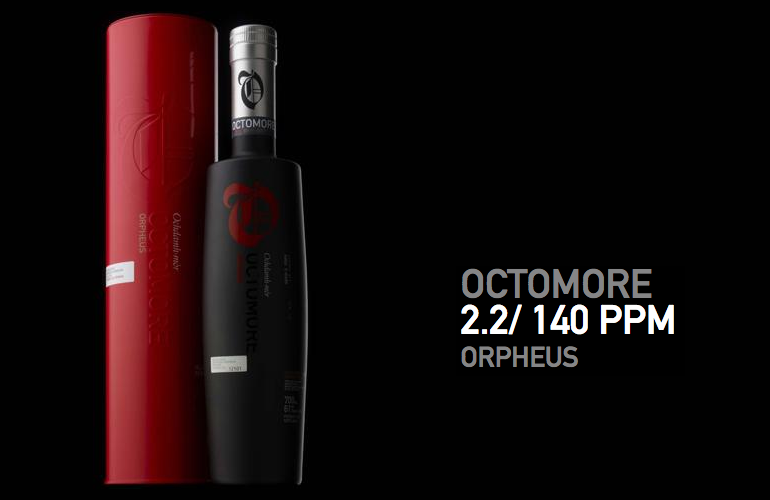 None of the older Octomore editions are particularly easy to get hold of, but due to its almost cult-like status, Octomore 2.2 Orpheus is even harder than most. If you can get your hands on a bottle, or a dram, don’t hesitate; in all likelihood you won’t get another chance to try this phenomenal whisky.